The first feature you’ll want to know about is Company, one where you can create several companies and share them with partners. For collaborations, this is essential since you may have to partner with multiple entities when working on major projects. Being able to track and manage workflows for each company is impossible through any other project management software. Whatever type of product you are bringing to market, the Product is a powerful tool that lets you better manage how you handle product development from the planning stage to implementation using agile methods like Scrum and Kanban. It ensures great cohesiveness and excellent results for the team and each team member working on your product in every department. Track what they’re doing and what stage they’re at in the product development pipeline. Collaborations can occur through this method as well without even having to meet in person. As soon as your product is created, you’ll want to use the Release to help your team plan and track the development process, structure the workload, and create intermediate reports and presentations of the product to third parties. Use a Gantt chart to give you a timeline of your work plan, and list all of your sprints throughout the product development cycle. Speaking of Sprints, Z-Stream has standalone functionality designed for these. If you’re new to how sprints work, they’re defined as the amount of work you’ll plan for a certain period of time in the near future. 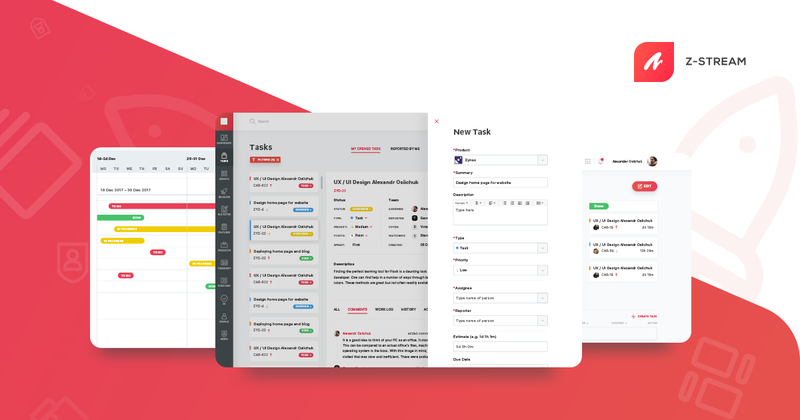 Our feature lets you create sprints and manage them in every detail, from the planned draft phase to completion. You can customize your Sprint board easily to suit your company’s work processes when working on a particular product. One of the most important functionalities is Tasks. This is where all tasks linked to a particular Sprint of a certain Release can be created and easily managed. Backlog tasks not related to your sprints also have their own category here. These are tasks you’ll take on later, yet don’t want to forget. While tasks are underway, you can track their progress status based on assignee log times. A special time tracking scale shows such important information as estimated, remaining, and logged time. The vast functionality of Tasks is not limited to that, of course. With the help of it you can set priorities, assign responsible people, choose the type of task you’re working on, and apply many more easily customizable settings that ensure you achieve your goals. Visit at Zazmic, Inc. for our next blog where we’ll discuss other Z-Stream features that help you manage the product and control execution.